When you want to brighten up your home's interior, your first thoughts might lean toward the traditional: new latex wall paint and a new color. Dingy, worn, and simply outdated colors can be freshened by adding newer, brighter colors over the top. But what about breaking out of the norm and taking this brightening-up campaign one step further by adding metallic wall finishes? Metallic paints and coverings are wall finishes that have the ability to truly coax ambient light to linger and add shimmering, glittery style to even the most ordinary space. Metallic wall finishes fall into either of two categories: metallic wall paints and solid metallic wall coverings. Metallic paints are often water-based for easier application and clean up. They apply the same as other paints: rolling, brushing, or spraying. Unlike usual interior paint, though, metallic wall paint has actual non-tarnishing metal or metallic-look flakes as part of its solids content. Since metallic paint is such a specialty product, it often costs twice as much as even premium interior latex paints. In a few cases, wet-application metallic wall finishes even extend to plasters and stucco that trowel on. Metallic wall coverings help you avoid liquid application. These heavy-weight paper- or plastic-backed wallpapers are sold as rolls that typically are 18 inches to 24 inches wide and in lengths that extend from ceiling to floor. Metallic wall coverings offer you instant results and eliminate the mystery of wondering what the finish will look like when dry. The metallic appearance is achieved by incorporating metal flakes or glass in the product. With the Modern Masters Metallic Paint Collection, you can add a little sparkle to your wood trim or paint an entire wall a luminous, metallic shade. The paints contain metal particles and pearlescent pigments for a realistic effect, but they are water-based and low-VOC. Modern Masters also sells Venetian and metallic plasters as well as ShimmerStone, a trowel-applied wall finish that mimics subtly layered stone or raw silk. For a high-end look, Studio E offers a line of handmade metal leaf wallpapers that are smooth, dense and finished with varnish for extra durability. Studio E is green in that it uses no large machinery, is naturally lit, and the paper contains no toxins or vinyls, which can off-gas VOCs. Studio E also uses water-based paints and post-consumer recycled poly/cellulose fiber. Princess Leia is one of Studio E's standout metallic wall coverings and adds a textured leaf combined with a cross-hatch design that evokes a fabric feel. In gold, silver, platinum, or white gold, this wall covering has the range of precious metals covered. From a distance, this wall covering looks like any other metallic wall finish. Except it's not. Up close, you begin to see thousands of tiny glass beads that comprise this sparkly wall covering. From Maya Romanoff as part of the Bedazzled collection, Scotch on the Rocks is a truly enchanting metal-look wall covering available in rolls 28 1/2 inches wide by 9 feet long. Handcrafted in the Maya Romanoff Chicago studio, this wall covering is PVC- and formaldehyde-free and contains no heavy metals. 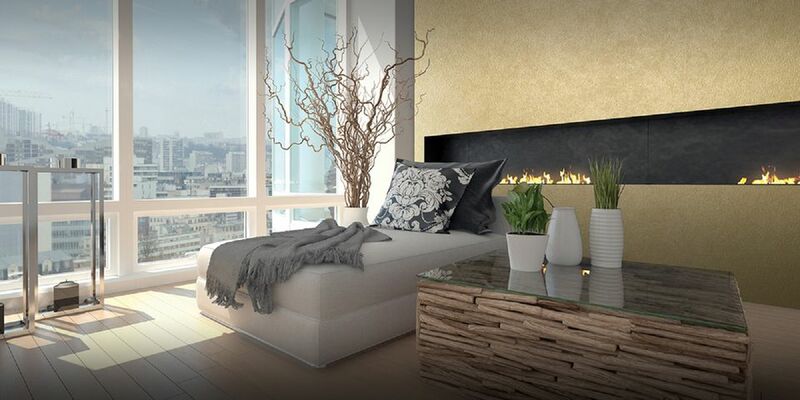 Choose this cover when you want to create a dramatic accent wall within any space. Not all metallic paint needs to look gold or silver. Meoded Paint & Plaster Sapphire Metallic Paint has a 39 color palette. Plus, Meoded will match any color found on Sherwin-Williams, Benjamin Moore, and other major paint manufacturers' color fans. Metallic paint doesn't always have to be expensive. PPG Paints' Metallic Tones Interior Paint gives your walls the look of hammered metal. Use it for trim, details, or even for entire accent walls. Found at Home Depot and other paint retailers, Metallic Tones Paint brings down the price of metallic paint to reasonable levels. In many instances, this product costs about the same as conventional mid-premium acrylic-latex interior house paint. For the hammered gold effect, roll on a first coat with a 9-inch roller with a 3/8-inch nap. Dab around the edges with a sponge to add texture. Allow the paint to dry, then apply a second coat with a faux finish sponge roller. Adding textures creates more angles to reflect the light. This paint cleans up easily with warm water and mild soap.